Sure, the gaming side is cool. Battling space aliens or shooting bad guys with virtual reality products like Google’s new DayDream VR, Samsung’s Gear VR, Sony’s Playstation VR, or PC-driven systems like the HTC Vive and Oculus Rift is a blast. But despite all the focus, I don’t think gaming will bring VR into mainstream acceptance. In fact, having recently had the opportunity to spend some quality time with an HTC Vive headset powered by one of the first notebooks certified to support high-quality VR — the Alienware 15 from Dell, powered by Nvidia’s GTX 1070 GPU — I am even more convinced. The challenge is that much of the VR-based games are designed for and targeted towards hard-core gamers, which only make up a fraction of even those who play computer or smartphone-based games—let alone the general population. Instead, to reach a wider audience, VR experiences and applications like virtual travel need to take center stage. There have already been some very interesting case studies done with bringing these types of non-gaming VR experiences to the elderly. I’m certain people of all ages will quickly become attracted to VR once they get a chance to try these devices with the right kind of applications. 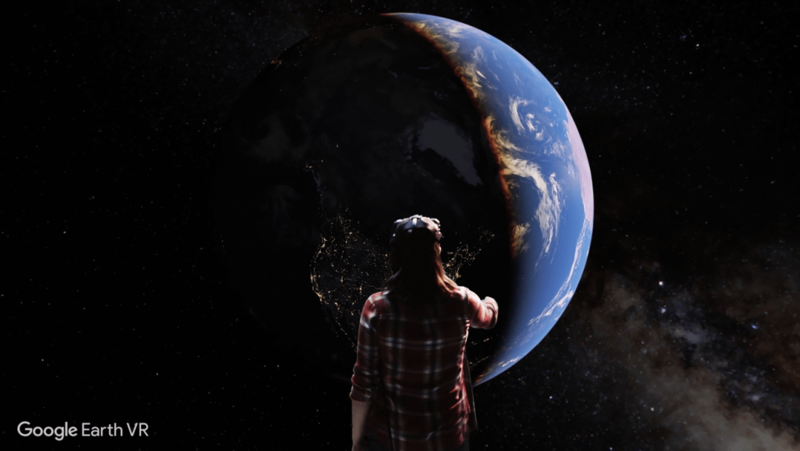 A great recent example is the newly released Google Earth app for Vive, an awe-inspiring example of how powerful and transformational VR can be. As with other iterations of Google Earth, you can explore any location on the planet, leveraging the impressive collection of satellite imagery Google has collected, or you can view some pre-designed “tours” of famous locations around the world. With the VR version, however, instead of just looking at these locations, you start to get a sense that you’re actually in them. In fact, once you’ve tried the VR version, you realize the whole Google Earth concept was really made for virtual reality—it just won’t be the same anymore on other platforms. The newly released Google Earth app for Vive is an awe-inspiring example of how powerful and transformational VR can be. As impressive as it is, however, Google Earth VR also highlights some of the challenges of current VR devices and experiences, particularly around the display resolution of current headsets. Some of the 3D buildings in cities, for example, look a bit “cartoon-like” because none of these systems have the graphical resolution (nor the data resolution behind them) to create a life-like viewing experience. Don’t get me wrong—it’s still great, but you can tell that we’re still in the early stages of VR technology development for some of the really demanding applications. The challenges of the hardware setup also highlight that PC-based VR is not quite ready for the mainstream yet either. Though a VR-capable notebook is certainly a lot easier to move around than the big desktop rigs that have been necessary for VR until very recently, all the wires that the HTC Vive headset and its various accessories require makes mobility an unlikely option. HTC did just announce a new wireless accessory for Vive in China, but while it removes the direct wired connections from the Vive headset to the dongle box that plugs into the PC, there are still a lot of pieces that need to be powered and connected. Despite some of these hassles, the result is worth it: the all-encompassing 360° view that the Vive provides can be quite impressive, particularly on content specifically designed for VR. A surprisingly compelling example of this comes from Jaguar’s new introductory experience for their upcoming electric car. Though it’s essentially a VR product brochure for the newly announced vehicle, the application does a remarkable job of utilizing current generation VR technology to let you truly get inside and experience the car. Not only do you get to see via 3D models how different elements of the car function and come together, you can also view and explore the car’s interior design and layout. Jaguar used this VR experience at the car’s recent launch event in LA, but it’s just as compelling now for anyone who wasn’t there. More importantly, it highlights how companies will be able to leverage high-quality VR for creating some very persuasive marketing materials. The educational opportunities for VR are also enormous. From explorations of human anatomy, to science lessons on how atoms work, to virtual field trips, it’s easy to imagine the kinds of applications that high-quality VR devices will start to enable. In fact, I wouldn’t be surprised to start seeing these kinds of applications show up on Sony’s PlayStation VR—despite its gaming heritage. Once more people have the opportunity to see and experience the kinds of new possibilities that non-gaming VR can bring them, I’m certain we’ll start to see the market grow well beyond its currently modest size.